The 2019 Virgin Money London Marathon takes place on Sunday 28th April. The London Marathon was first run in 1981 and has since grown to become the third largest running event in the UK, after the Great North Run and the Great Manchester Run. Last year over 40,000 runners started the event. The weather conditions on the day can have a big impact on performance. Research suggests the performance of runners in marathons decreases as the wet bulb temperatures increase from 5C to 25C. Higher wet bulb temperatures indicate more humid air. What's the London Marathon weather forecast looking like this year? 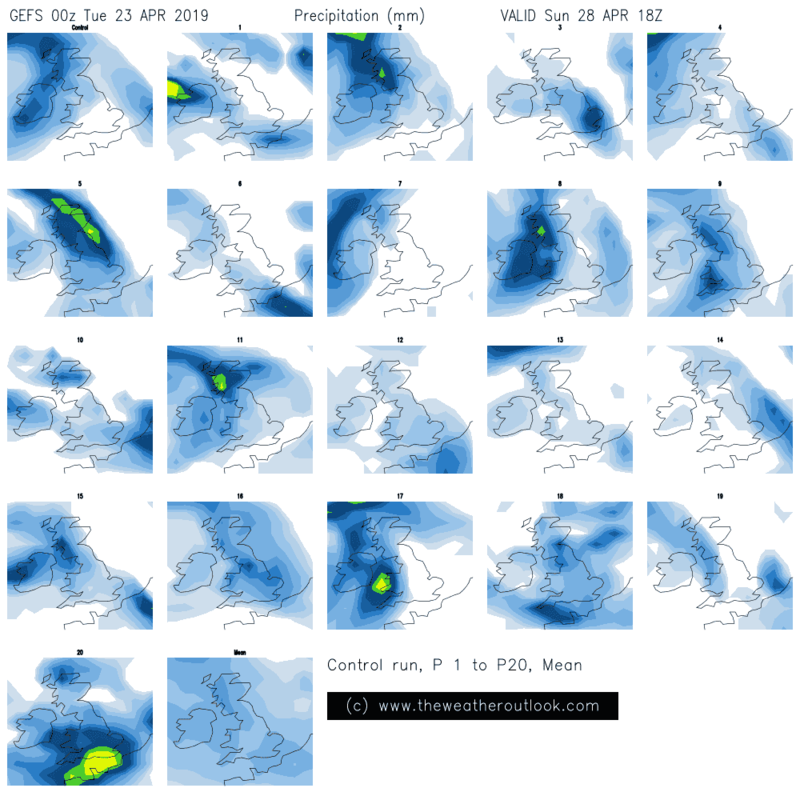 The GEFS 00z postage stamp chart below shows forecast rainfall for 12:00 - 18:00 GMT on Sunday 28th April. The number of runs showing rain suggests the risk is greater than average. The chart below shows the maximum forecast temperatures at the same time. The spread ranges from 10C to 17C, although the GEFS often underestimates values by a couple of degrees. The likelihood is the London Marathon will be run during a period of unsettled weather. Therefore the chance of showers or longer spells of rain is quite high. There are also indications that it could be windy. Temperatures are likely to be close to the late April average.